I’m delighted today to announce that right on the heels of our fully automating postings delivery to Bebo, I have just published the Lost and Found Pets Ireland Bebo App (Beta). The app gives Bebo users an easy way to view and share the latest lost and found listings from our site thus exposing the listings to a much wider potential audience. It has always been my intention to push further into Bebo but this wasn’t possible until now what with all the other functionality I wanted to build out on the site, so I am really pleased to have reached this point. 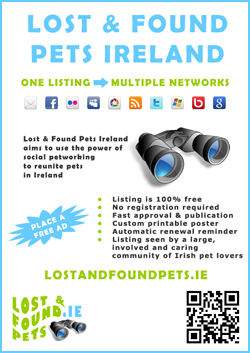 We badly need testers so check out the Lost and Found Pets Ireland Bebo App and let me know what you think of it so far – there is a feedback link on the top right of the app page so you can do so easily. Feel free to friend us too. In the coming weeks I plan to port the app to Facebook too as the API is very similar there.